Innovations, investments, opening to new markets and to the social world: these are the abilities of the Franzosi family to grow and adapt to the passing of time, relying on well-established roots. 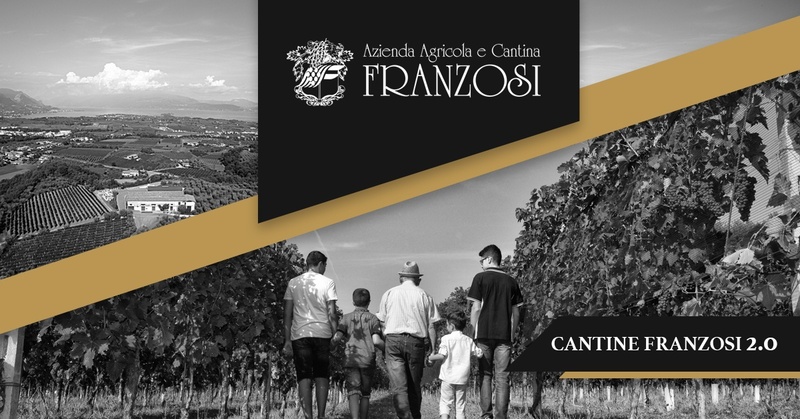 Azienda Agricola & Cantina Franzosi: on the one hand the ability of the family to innovate and evolve over time, on the other the attachment and enhancement of the past and the territory. The company Franzosi has ancient origins, it was in fact created in the ’30s by grandfather Giovanni, passed into the hands of his son Bruno up to the three nephews Paola, Giovanni and Luigi. Where is located Cantina Franzosi? The winery is located in Puegnago del Garda, in the heart of Valtènesi, on the morainic hills of Lake Garda, in the province of Brescia, renowned for the production of wine and oil. Years pass, but the passion for the area remains a special feature of Franzosi. The last generation, represented by the three brothers, has, supported by the experience of Bruno, decided to expand the area of belonging and its characteristics, to discover new markets and to focus on large investments. From technological innovations to wine production and bottling techniques, to the use of innovative materials, to the commercial side, in Italy and abroad, to sponsor the brand to a wider audience. We want to push the limits and exploit the potential of the Valtènesi to work on the quality of our wines. Over the years, the best grapes have been selected, healthiest and most mature, to produce great wines. The real challenge has been to change the way of communication opening up to the world of Web 2.0 and social networking. The philosophy of Cantina Franzosi is dedicated to its terroir, the wines must be the individual expression of their soil, climate and work in the vineyard. Cantina Franzosi was founded with the aim to recapture the ancient traditions while using the new agricultural and oenological techniques and technologies that have helped to improve the quality of the wine and wine making processes. Everything starts with a belief: quality is preferred to the quantity. The firm belief that the quality of the wine is created in the vineyard brings uncompromising work, combining tradition and innovation, knowledge and respect for nature. A great value is dedicated to the terroir of Lake Garda and the wines are an expression of the soil, the climate and the cultivation in the vineyard. We select only the best and healthy grapes, so that the best grapes reach the optimal maturity. The wines have character and elegance. The climatic conditions and the excellent locations of the Estate allows us to produce fresh and fruity white wines, as well as concentrated and velvety red wines. And this fact is reflected in the fact that current consumers are becoming ever more careful and aware of the quality of products and raw materials and tend to drink less but better. Tourism on Lake Garda is an excellent business card, but in order to make our products (white and red wines, Chiaretto, grappa, sparkling wines, oils) known to an ever wider public, we have been taking part in prestigious fairs and events in the national and international panorama for some time now, such as Vinitaly Fair in Verona and ProWein in Dusseldorf. Since 1965, the year in which the various competitions took place, the Azienda Agricola & Cantina Franzosi has been collecting numerous awards and acknowledgments confirming the value of our products and our efforts. Franzosi wines are suitable for every taste and every occasion. When talking about aperitif wines, our Valtènesi Chiaretto Riviera del Garda Classico DOP is a young and fresh wine that can give a good structure like a red that is appreciated for its tasty, rounded and balanced taste. Do you want to taste the most characteristic white wine of Lake Garda? Lugana DOP, modern wine of the old tradition, with its fresh taste, soft and persistent, suitable as an aperitif or as an accompaniment to appetizers, fish and seafood. Alternatively, the Garda Chardonnay DOP, warm, long-lasting apple and banana flavours, as well as a complex exotic fruit sweetness characterize this juicy, tasty wine of lasting consistency. Pleasant fullness, well-integrated acidity and harmonious-fresh elegance shape the flavours. This wine is suitable as an aperitif and goes well with main dishes, fish, shellfish and shellfish and poultry. Do you prefer more full-bodied and structured wines? Be inspired by our Riviera del Garda Classic DOP Groppello, Benaco Bresciano Rebo IGP to the Garda Classico Rosso Superiore Privilegio DOP, awarded as an accompaniment to red meat, cured meats and mature cheeses. Learn our wines and their character, discover our world. We await you in our shop and cellar to enjoy and discover the ancient flavours. In addition to the internal showroom for private shopping, our wines are also available in the best hotels, restaurants, bars not only in Italy, but also abroad. Wine, oil, vinegar, grappa, but also delicacies and wine products populate the room for tastings. What are you waiting for? To taste and buy our typical products such as wine, oil, vinegar, grappa, but also our food and wine specialties, we expect you in the wine cellar. Information can be found here.